Govt. 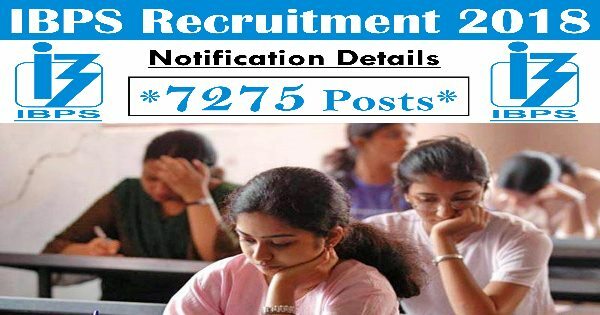 Jobs: IBPS Recruitment Clerk 7275 Posts 2018. IBPS Recruitment Clerk 7275 Posts 2018. Institute of Banking Personnel Selection (IBPS) Recruitment 2018 invites job application. This jobs is for the Clerk-VIII. Candidate from the All Over India will apply for this job. Pay Scale: 19,000 -/- to 35,000 -/-. Last Date for Submission of Application: 10 October 2018. Every year a number of job opportunities become available in the Government Sector.No. of vacancies are expected to be created this year also, encompassing important sectors like Banking, Railways, Insurance, Civil Services, Medical, Media and many more.Educational qualifications for these jobs vary from Intermediate to Post Graduate.